Besan cheela also called as vegetarian omelette, is a gluten free Indian savory pancake | crepe. It is a perfect breakfast | dinner recipe. I have given this recipe for the kungumam thozi supplement, 2 years back. In that i have added oats flour and besan flour to make it even more healthier. 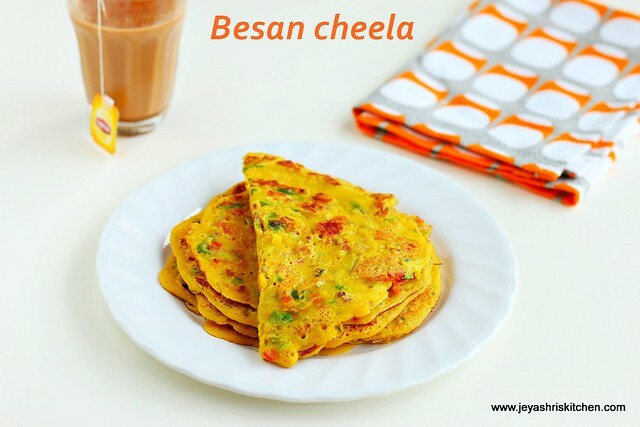 I have heard about this besan ka chilla from my friend many years back. 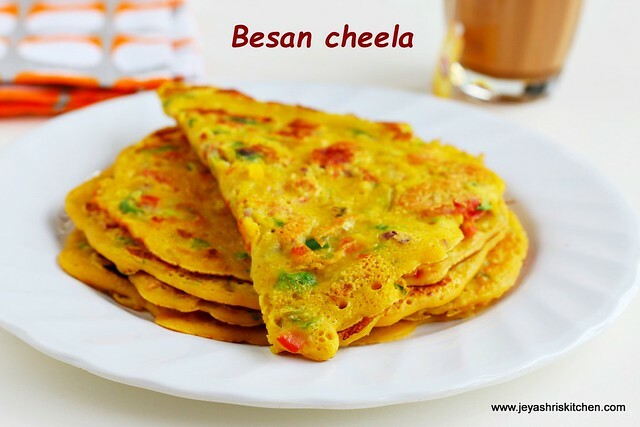 If you have tasted egg omelette, you can vouch that this besan cheela will taste similar to that. You can serve this cheela in between toasted bread and also pack the same for kids lunch box too. Finely chop the onion, tomato, green chili and coriander leaves. In a bowl add the besan, onion, tomato, green chili, bell pepper, salt, turmeric powder and garam masala (if adding). Ensure all the veggies are very finely chopped. Add water (approximately 3/4 cup) and mix it nicely without any lumps. You can sieve the flour also. Let the consistency of the batter be that of dosa batter. Heat a pan and pour 1 big ladle of the besan batter on the pan. Once it gets cooked on one side, flip the cheela. Add 1/2 tsp of oil and take out from the pan. Serve with tomato ketchup. You can have this plain too. Keep the onions and tomatoes finely chopped. Else it will be difficult to spread it while cooking. You can add grated carrots to the batter. You can add 1/2 cup of besan and half cup of oats flour or any miller flour. wow this looks so good. This is my very favourite evening snack and sometimes it becomes the breakfast recipe. my mom serve us with toasted bread. This we have until stomach fill.